Wasps are not your friend. Usually, they would not go out of their way to attack you but if you let them, they have the tendency to take over your house and yard in order to build their own homes. And when you try to intrude into the progress of their construction, they attack. Again, when there is an impressive number of them around you without your knowledge, you could be attacked and you do not want to be stung by a wasp. There are various methods of getting rid of wasps and sprays are one of the commonest and they can be quite effective. However, there are disadvantages to using them that may make you pause. Then, there are wasp traps. These are easy, safe and yet effective ways of getting those buggers to leave your house alone. 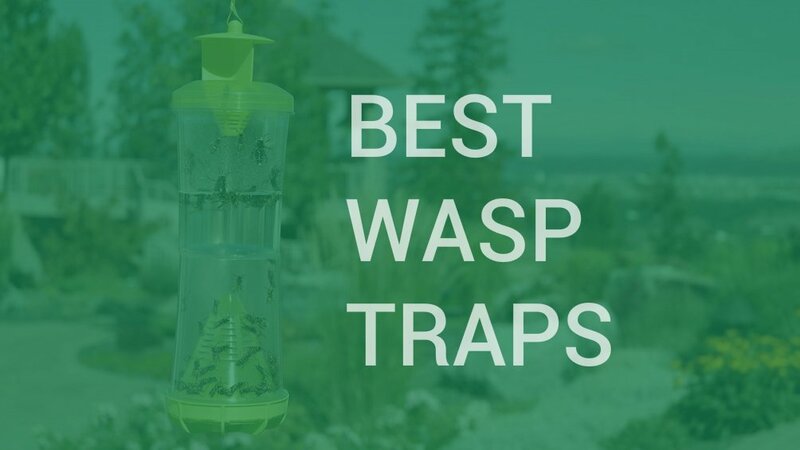 This buying guide will show you what you need to know about them and how to pick out the best wasp trap for your specific needs. There are professionally made wasp traps and there are those which you can make from the comfort of your home. Basically, they work in the same manner: trap wasps until they die. The tools for a homemade wasp trap can be found all around you; things like a plastic bottle, a knife and some liquid (not necessarily water). You are not restricted to these particular items but it is necessary to use a bottle with a narrow opening so that the wasps would be effectively trapped, without having a way to escape until they die. Professionally made wasp traps may use powerful lights to attract different types of insects, including wasps, instead of using food. One of these would work perfectly as a hornet and yellow jacket trap. Once they get close to such a trap, there is a fan to blow them through a narrow hole and keeps them from escaping. Both homemade and professional wasp traps are highly effective in killing off a modest infestation of wasps. How does a wasp trap work? Now, do not get it wrong. Wasps have their uses; they are not all bad. They help keep insects and bugs, which are harmful to your gardens, away from them, as well as bring about pollination. The only thing is that they usually invade spaces where they end up being harmful to you, instead of useful. So, to keep them from overstepping this invisible boundary, it is necessary to start early. Wasp queens start nesting in spring and if they find a good place to nest in your yard or home, you may have a big problem. So in a situation where there are a disturbing number of them building houses and stinging you, you need to set a wasp trap early in spring before their nesting starts. Once a queen starts nesting, the population would increase and the trap may not be as effective as you may need it to be. Here is how most homemade wasp traps work: choose a bottle with a narrow mouth. Use a knife to cut the bottle at a spot not too close to the top then, pour some form of liquid into the bottom part of the bottle. Tuck the top part which you cut out into it, with the narrow mouth pointing into the bottle of liquid. Your trap is complete. The next step is to place it in a strategic place, where wasps would easily get to them and be baited. You can use water as the liquid in the bottle; it must not be a sweet liquid. In the event you choose water, you can coat the mouth of the bottle with jam or any other sweet and sticky liquid in order to attract the wasps into the water. And if you choose soda or wine, its smell would attract them to your trap and draw them in. You have to note, though, that this type of trap may equally attract bees so to keep bees away, add a little vinegar to the liquid. Meat would work better as bait during spring months while a soda or any other sweet drink would work better in summer months. Safety and eco-friendliness: Generally, wasp traps do NOT involve the use of harmful chemicals. However, some of them might also trap small birds. This is particularly true of wasp traps that work with a sticky surface. So do check to ensure that the trap you are going for has a bird-guard feature if you are concerned about NOT trapping small birds along with wasps. Entry design: Make sure that the entry design makes it easy for wasps to get in but impossible for them to come out. Some traps have more than one entry point to increase the ease with which traps can get in. Bait type: There are different types of baits that are used for wasp traps. Some products come with their own special formulations, some come with a recipe (but expect you to make them) and some yet come just with the trap, allowing you pick the bait you deem most appropriate. In fact, there are some traps that use non-food baits like beautiful color patterns and/or light to attract wasps. So while going through our review of individual products, pick the product that is most suitable for your peculiar needs. Durability and re-usability: This determines how long you can use a trap and still enjoy effective service. Obviously, the longer you can use one, the better. But that said; this has to be counterbalanced against the cost. Power source: Some wasp traps use UV lights. So if you prefer those options, you need to know what the power source is. Is it battery, will you have to plug into a power source or will it be solar powered? Effectiveness: What’s the point in buying any product that doesn’t deliver as advertised? The answer is none. So while there is a wide range of wasp traps out there, some are more effective than others. Ease of set up/Maintenance: Generally speaking, wasp traps are easy to set up and maintain. But even at that, some are easier than others and some require little or no maintenance. Choose according to the level of ease/maintenance you are comfortable with. 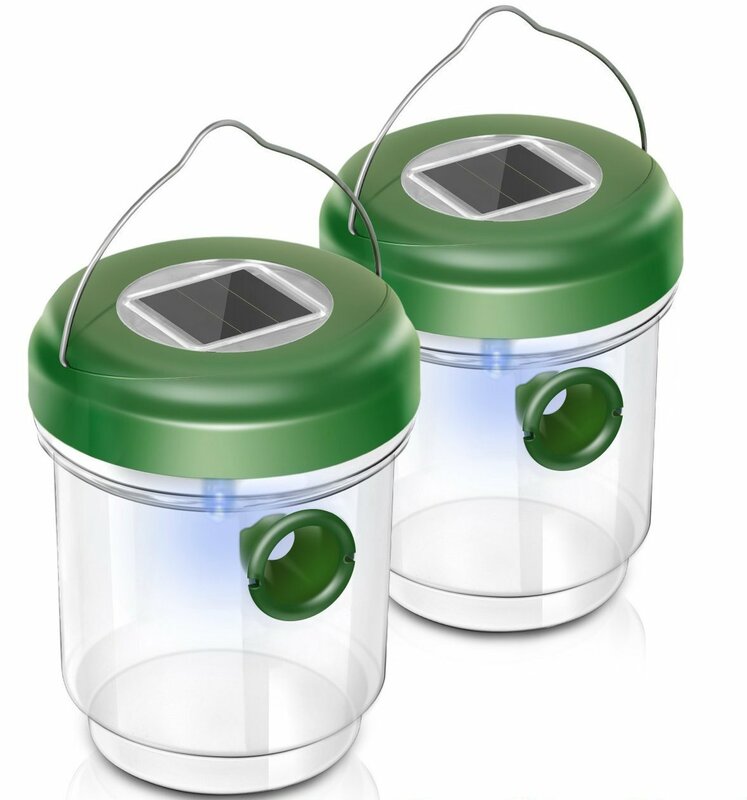 Weather/waterproof nature: If you want a wasp trap that you will use outdoors for long then you need one that is both weatherproof and waterproof. So check as this will determine both how effective and for how many seasons you can use a particular wasp trap outdoors. When to use a wasp trap or any other treatment? Wasp traps are a great way of getting rid of wasps and seeing that they are easy to make and safe to use, many people with the problem of too many wasps around them may be tempted to just use traps alone. But there are a few things you need to put into consideration before you can decide if traps are the best way to go. Level of infestation: If you have a garden, especially a garden of flowers, you should expect a number of wasps and bees to come to your house. They are natural pollinators of flowers and if they do not do that, the pollination process would not be achieved. However, when the usual number is exceeded, you should begin to find a way to keep them at bay. And if you do not have a garden at all, you should be worried. While wasp traps are effective and safe, you should know that they do not completely get rid of an infestation. Even the best wasp trap would not fully remove an infestation. You may need to use sprays or get a professional if the infestation is severe, instead of using a trap. A wasp trap works best when there are a few pesky ones that have stepped over the boundary and are buzzing around your home. If you have not located a nest: If queens have started nesting in your yard before you discover their presence, then a wasp trap may be effective. You can place one or two traps around the nest and see wasps reduce in number as they drop into them. But using a trap would draw them from far and near, wherever they may be. Even if the nest is underground, the trap would work. Wherever you place a trap, as long as the bait is still effective and fresh, the wasps would come. As long as there is a wasp problem, placing a trap anywhere in your yard would draw them to their death. If you have located a nest, then the number of wasps may be too much for a trap to work for them. Usually, a nest has a concentration of wasps; both adults and baby ones. Getting rid of wasps from a nest is not an easy task, except you find a way of destroying the queens and every egg so there is no chance of reproduction. It is good if you locate their nests so that you can remove them, use a spray or call a professional. Species: You do not have to worry about this. The species of wasp does not determine whether a trap would catch them or not. Every wasp responds to bait and every wasp catcher has some sort of bait attached to it in order to be effective. So it does not matter the species of wasp you are troubled with; as long as your wasp trap is set appropriately, you have no problem. Even though this list is not exhaustive, it would serve you well to keep these points in mind when electing to use a trap above any other treatment method. Let us now look at the review of 10 trusted wasp traps from some of the most trusted brands. Dimensions: 19” x 11”; Wire length: 5 Ft.
A subsidiary of 360 Designs Groups, Hoont is a name which is well-known in the animal and pest control industry, producing a wide range of some of the best quality products which are safe to be used around your family and effective in eradicating pest problems. Over the years, the brand’s commitment to its customers’ satisfaction has not diminished as it stays dedicated and focused to make sure everyone who comes to it does not go away disappointed. Not only does it manufacture great products, it also delivers them at great prices. There is barely any combination that can beat quality and affordability. You do not have to break the bank to be able to afford its products, with the Mosquito Killer and Gnat Fly Trap Killer as a standard example. You can hardly go wrong with this product from the stables of Hoont. The Mosquito Killer and Gnat Fly Trap Killer is a powerful insect trap which uses light and fan to trap insects. It also works well as a wasp catcher. 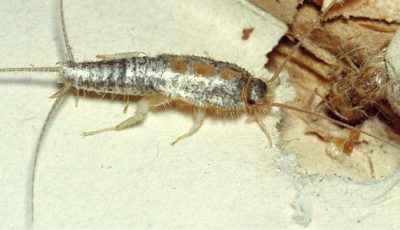 Most insects find it hard to resist bright lights, especially artificial ones, so with the UV bulb, the trap draws them and the fan blows them into the trap, from where they cannot find their way out. This trap works naturally, without employing the use of chemicals or pesticides. There is equally no liquid in this trap to drown the insects but they die from dehydration and hunger over time. So it is safe to be used around your kids and pets without fear of poisoning. All you have to do to get it going is to plug it into an electric outlet and it is functional. In addition to working without the use of pesticides, it also has no odor. This is a plus because you do not have to worry about some smell, pleasant or not, permeating your house whenever you have to use the trap. And in the same vein, it makes no zapping or buzzing sound, as quiet as silence. You and your family are not unduly disturbed because of the presence of a trap. You would hardly know there is such an object in the house if you did not plug it in yourself. What’s more, it is easy to clean. The trap contains a tray into which the insects fall and when they are dead, all you have to do is pull it out, empty it and place it back where it belongs. It is an easy enough thing to do; even your child can get that chore done. Founded in 2009 in Florida, Adoric is committed to bringing you the best that can be got in the home accessories industry. From kitchen, homecare and bedding accessories to childcare products, it has set the standard for others to follow and a high mark that few have attained. It does not just rely on its knowledge to bring the best; it equally listens to its customers and experts in order to understand what is needed and what is best and then, create better products while improving on the existing ones. You do not have much to worry about when you trust Adoric with your home comfort needs. Most of its products are household names, serving quality with durability and affordability. These can be seen in the Adoric Life Wasp Trap Catcher, one of the brand’s ways of ensuring your safety while making sure you remain comfortable in your own space. One of the outstanding things about the Adoric Life Wasp Trap Catcher is that it is a wonderful yellow jacket trap and also a great hornet trap. It goes beyond your everyday wasps to the different types that may defy other types of wasp traps. The combined forces of the powerful ultraviolet light and the sugared water you can add to the trap far outweigh the resisting powers of those species of wasps. These baits work as well on bees and a myriad of other insects to draw them in and trap them in the water until they drown. Another outstanding feature of this hornet trap is that it is powered by sunlight. This means that you stand no chance of any mishap with electricity and you also have a constant, highly-functional trap. There is no time you run out of power in it and you do not have to look for suitable batteries to power it. Just place it out in the sun and the UV light comes on, drawing the insects in their numbers. Furthermore, the clear body of this trap gives the wasps and other insects the impression that they can escape so they are quick to get to the inviting entrance and once in, they find no way out. It is made of Amorphous Silicon, the lid is made of polypropylene plastic, which is durable, and it has a stainless steel hanger which does not rust easily. You are not limited to keeping this wasp catcher on the floor but have the option of hanging it out in your yard at a safe distance. Cool, right? If you are looking for the best wasp trap out there, you may want to consider this one. Are you looking for a brand that offers top shelf and efficient products at wallet-friendly prices? Then, Hoont is the brand for you. 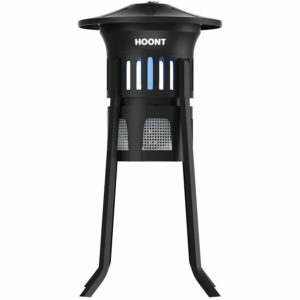 A top name in the field of garden equipment and pest control gadgets, Hoont is capable of alleviating your garden related problems. With a team of dedicated product scientists and technologists, its shelves and product lines are always stocked with the latest cool and stylish products for your garden. Hoont has integrity and passion as its watchwords. This is why it churns out top quality products consistently. A fact that has led to its meteoric rise in terms of growth and market capabilities. Not only that, Hoont has added impressive customer service to its already impressive portfolio in recent years. It receives very few complaints but when it does, concerns and issues with its products are handled quickly with no fuss. What more could you want in a brand? Relaxing outdoors is one of nature’s greatest gifts. Few things are more soothing than an evening spent outdoors swapping stories with the family while enjoying a calm summer breeze. However, with the outdoors come all manner of creeping and flying insects, chief among them wasps. A bite from a wasp is enough to ruin one’s week. These pesky winged creatures have no respect for a hardworking citizen like yourself that is why you must afford them little to no breathing zone. 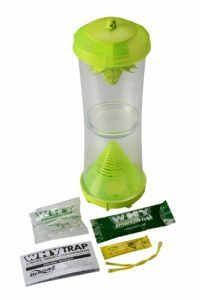 With a functional wasp trap, you can capture wasps, bees, hornets and many other of their winged relatives. Wasp traps come in different specifications and types. There are paper wasp traps and glass wasp traps. That is why we have taken the pain to select one of the best traps in the market for your perusal. 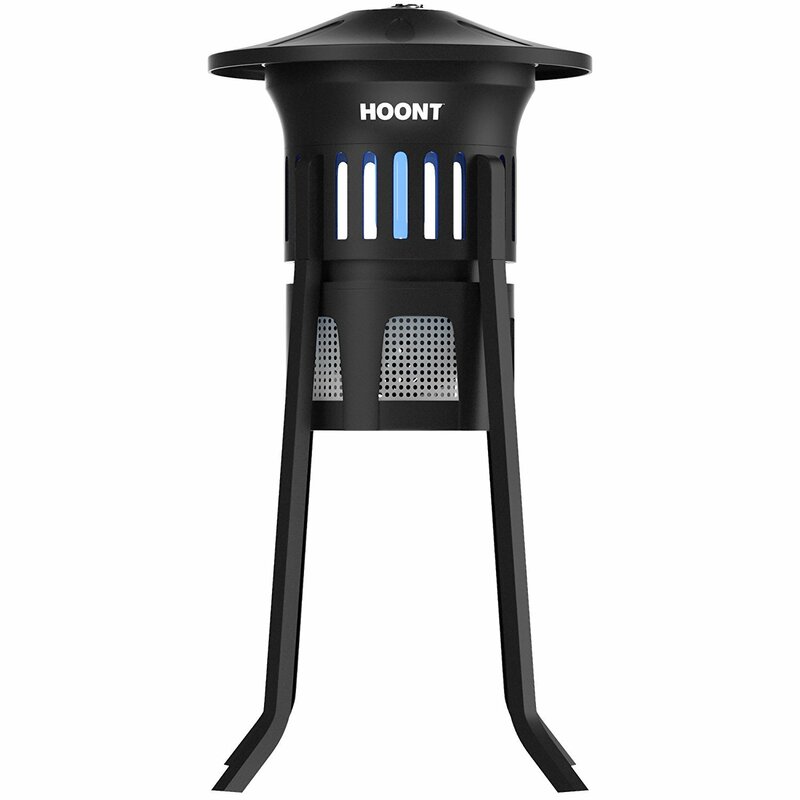 We present to you the Hoont Solar Outdoor Wasp Trap Killer. The Hoont Solar Outdoor Wasp Trap Killer is one of the most effective wasp traps on the market. This is because it is outfitted with double entry tunnels on either side. These unique tunnels increase its trapping power as there are more entrances for unsuspecting wasps. With an easy to prepare wasp bait such as sugar water or syrup, insects are drawn in and trapped via these double entry tunnels. Within hours, dehydration and drowning occur and your corridors and gardens suddenly become heaven again. 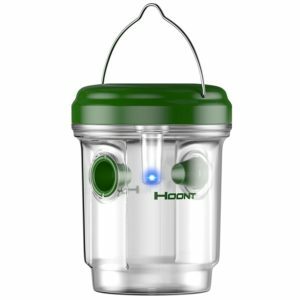 While other wasp traps rely only on the irresistible smell of wasp trap baits to lure insects, the Hoont Solar Outdoor Wasp Trap Killer adds a simple UV light to its arsenal. Blue in color and safe for your eyes, the UV light is guaranteed to aid in the capture of as many wasps as possible. It also recharges itself automatically via solar power and comes on at night without human effort. Talk about your wholesome wasp trapping experience. This wasp trap is elegant in its simplicity. It is easy to setup and requires no professional experience before use. It is also easy to maintain. Once the compartment is filled with dead wasps, all it takes is a simple unscrewing and shaking of the device to dispose of the insects. Convenience at its peak! Aspectek understands that your home needs protection from various pests and insects. That is why over the past decade it has dedicated itself to making every consumer’s home one hundred percent safe and friendly for the environment. Its products are designed for every corner of the home, both indoors and outdoors. With Aspectek, you needn’t worry about getting technologically backward products that will fail when the time for use arrives. It is a brand that is technologically ahead and it keeps the pressure on with a team of scientists devoted to making your optimum comfort attainable. 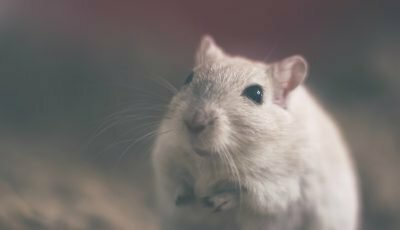 In fact, Aspectek is one of the few brands that have been able to incorporate ultrasonic technology into some of their pest control products. Keep reading and see what Aspectek has in store for you. Have you ever envisioned a whole summer rid of some of the most bothersome creatures on God’s green earth? Yes, we are talking about a summer relaxing on the porch and corridor of your beautiful home without the irritating stings and bites of wasps, hornets and other associated disturbances. This vision is very attainable with an easy to use wasp trap. Armed with a sugary wasp bait and a working trap, your corridor could become that place of comfort that you have always dreamed about. Simplicity, effectiveness and durability, those are three words that can be used to describe the Aspectek Trap for Bees, Wasps, Hornets, Yellow Jackets. These specially designed plastic wonders lure wasps with an irresistible mix of water and sugar. And get this, it has multiple entry tunnels to catch and trap these winged insects. Another advantage of the Aspectek Trap for Wasps is that it comes equipped with an eighteen-inch cord. The durability and sheer length of this cord make it easier to attach the wasp trap to an ideal location around your patios, porches, and gardens. It is also very easy to set up. An easy to understand manual is included in its package. This manual expressively details how to prepare a functional wasp bait and how to set up your wasp trap in easy steps. Reusability is an important aspect of gadgets such as this one and the Aspectek Trap ticks this box impressively. Its capture chambers can be easily maintained by periodic washing and cleaning. Once the chambers are full, the insects can be easily disposed of and a new batch of bait can be prepared easily. 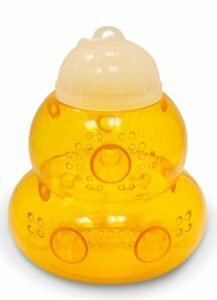 Since it is made of plastic, this wasp trap is extremely durable and is not susceptible to attack from adventurous predators. With over forty years of production experience behind it, Toland Home Garden is primed to deliver to your doorsteps, the most innovative products on the market. Right from day one, Toland Home Garden has been renowned for its innovative products. Its decorative garden art flags were the first to hit the market back in the day and Toland Home Garden has continued that trend with its latest line of offerings. Your comfort is Toland Home Garden’s interest and to this end, it has expanded its product line to include plant hangers, bird feeders, mailbox cover, comfort mats, rain gauges and much more. Its products have been endorsed by professionals all around the world. With Toland Home Garden, total comfort and optimum effectiveness are no longer a pipe dream. You have worked hard for most of the year. You have been able to get that apartment with the patio and outdoor swing that you have always liked. Now, it is time to kick back and relax on your patio, warm summer breeze in tow. However, your serene evenings are always interrupted by wasps, bees and other winged insects unspeakable. How then do you save your home from these wasps that have made the exterior of your home a no-go zone? With a wasp trap of course. With the technological marvel that is a wasp trap, you can effectively capture the insects that have made a cool, relaxing evening outside unattainable. 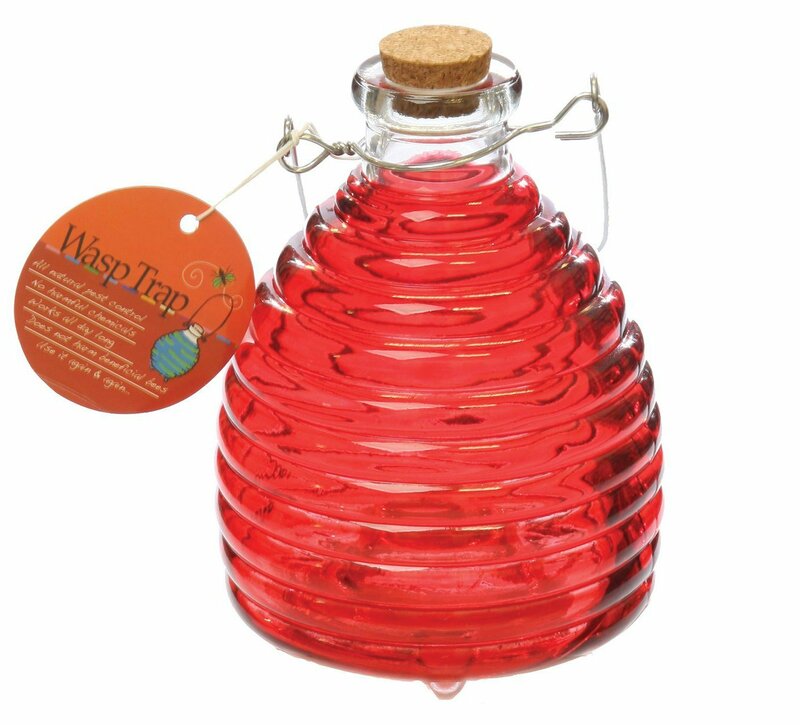 The Toland Home Garden Glass Wasp and Fruit Fly Trap is an all-natural remedy to your wasp problems. It makes use of a soda or sugar-based bait to lure and trap those pesky insects. Other wasp traps often incorporate some harmful chemicals in their bait formulas. However, with the Toland Home Garden offers, the vegetation surrounding your patios and porches are extremely safe. Toland Home Gardens knows your needs inside out. That is why this particular trap has been outfitted with a stand and a hook. This effectively means that your wasp trap can be hung conveniently without any issue. It can also be placed on a surface using the highly stable stands, depending on your trapping needs. Many users often complain that wasps and other insects often get away even after they have been trapped. Well, this is a non-issue with the Toland Home Garden Glass Wasp and Fruit Fly Trap. It has a sturdy cork top that prevents insects from getting away once they have been trapped. A trip into the always-open bottom of the trap is a no-return trip for any insects, especially wasps. For several years, Sterling International has been a leader in the pest management industry. Steadily progressing and offering some of the best solutions for pest control, it is vastly experienced in developing the most efficient and safe ways to control insects and other pests that are bent on invading our space. With serious attention to research, it has been able to consistently create different products that will help you control whatever insects or pests infesting your household. The RESCUE! Reusable Trap for Yellowjackets is a well-designed wasp hornet trap. It does not use any toxic materials or pesticides so it is quite safe to use anywhere. This yellow jacket bait is cylindrical and is designed to be tough so it can last through multiple seasons without needing to be changed. A yellow jacket attractant is placed in the bait so it can draw in these insects, trap them till they eventually die of exhaustion or dehydration. 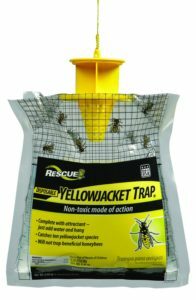 This Rescue bait is one of the best yellow jacket traps around. This is because it will attract and trap both the workers and the queen, depending on the time of the season you use it. Since it will trap the queen that makes it almost impossible for them to rebuild a nest. This product is packaged with an attractant that will last for two weeks. If you need more, you can easily buy one that will last you 10 weeks. This product offers a long-lasting control of annoying insects around your house. It is ideal for use at camps, parks, resorts, zoos, schools etc. Another advantage you will get from this yellow jacket trap bait is that it is low maintenance. You just need to put it in place with the attractant in it and that’s it. The only time you might need to go back is to empty it of dead insects to accommodate more and to replace the attractant. Agriculture. If you weren’t convinced before, we are guessing you’re now. It is fast acting so you can start trapping them in no time. Here is another product from Sterling International. We were not just talking about them for fun earlier. This company knows its onions. It is innovative and precise. Its products are always of top quality and perform impressively. Due to its consistency, it has become one of the most popular wasp control solution providers. It also has other products that help manage other pests. If you reside in the western part of North America and you are afflicted with wasp infestation, you are lucky to be reading this. The reason is simply that this product is highly effective against many species of yellow jackets in the West of the Rockies. It has a distinct design and the method it uses to lure and trap yellow jackets is quite unique. It is a double layer of the durable plastic bag that is designed to let wasps in easily but prevent them from going out. Yellow jackets are lured in with a water-soluble attractant. This wasp bait is so easy to use that you just need to add water and place it around the area you often see the yellow jackets prowl. The water-soluble attractant does its thing and the insects flood it and get trapped. They die in the water. When the trap is full of the dead insects, the top cap closes and then you can dispose of it all together. See! We told you it is easy to use. This wasp trap does not use any toxic chemical so it is safe and there is no fear of irritation, burns, or inhaling chemicals. The active ingredient in this product is Heptyl Butyrate which is a food grade compound found in apples and plums (but no eating, please). The manufacturer advises that the trap is placed about 20 feet from your area of activity. Perhaps that is so you do not become collateral damage from the warfare you started on them. The attractant used, while concealed in a bag, is still effective. This, to a large extent, makes it usable in enclosed areas. If for instance your basement is infested, you could hang this bait in there to control the infestation. This product makes for a good red wasp trap too as it lures both wasps and yellow jackets. Bio Care Naturals, as the name implies, is a company that is committed to using only organic materials for its products. It knows the harm too much exposure to harsh chemicals can cause. This is why it has taken it upon itself to manufacture equally effective products that do not expose your health to danger. Its all-natural products are safe to use and will still serve their purposes. When a brand cares so much about your welfare, it only makes sense to patronize it. 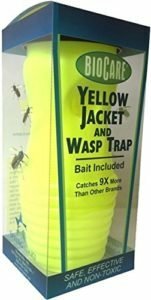 This Bio Care Naturals Yellow Jacket & Wasp Trap is one of the best wasp and hornet traps you can come by. It is a good solution because it will work against both hornets and wasps, so that is double value for your money. This sticky wasp trap uses translucent yellow pigment and UV dye to attract yellow jackets and wasps. When they get attracted, they fly into the lure and get trapped. It also has side entries which makes it easier for the insects to go in without obstructions. This product is quite easy to use and you don t need to bother maintaining it every now and then. You just need to hang it near where you have seen the yellow jackets and wasps fly a lot. Chances are it is close to their nest. That way, the attractant lures a lot of them and kills them thereby reducing the number of those pesky insects that invade your house. The trap does not use any toxic ingredients. No harsh chemicals, no insecticides, no sprays; and there is no fear of inhaling toxins that damage one’s health. It uses all-natural ingredients to help you control the insect infestation around your house so you can sit on the patio and enjoy the view of nature without getting scared of being stung. The method this bee and wasp trap uses to attract yellow jackets and wasps does not attract bees, so it does not get to kill them. This is a good thing as bees have important roles to play in our agricultural system. This trap is re-usable as you just need to remove the trap once it is full and replace it with another one. Sterling International yet again features on our list. When a particular brand shows up so often on our list, it only proves one thing. 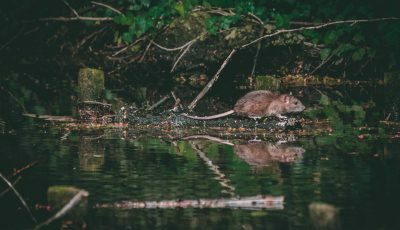 What this proves is that Rescue is a pest management brand that has consistently, and for long, offered products that have been effective at doing what they say they can do. This is the basis for customers to trust products and Sterling International has done a sterling job making Rescue that kind of brand. The RESCUE! Non-Toxic Reusable Trap for Wasps is one of the best yellow jacket traps on sale. It does not use any harsh chemicals or toxic materials in this product. It is all natural, even down to the attractant it uses. This is the ideal environmentally responsible way to deal with yellow jacket, wasps, and hornets infestation. This contraption is built with rugged plastic so it can last for multiple seasons. It is designed to be hung in the area where these insects have been known to roam. One great thing about this trap is that it will eventually kill both the queen and the workers. Furthermore, the bait it uses is strong enough to attract different species of flying and stinging insects. All you have to do is pour the bait on cotton wool and place it inside the plastic trap. That is how easy it is to use. This product is designed with a top and bottom chamber. The top chamber uses 2 baits, one that remains in the vial and another that is dissolved in the water. The bottom chamber is where you pour the bait on a cotton pad. These insects can fly inside the trap either from the top or the bottom, you will have to leave them to decide. If they get trapped in the top, they will eventually drown in the water. If they are trapped at the bottom, they will die of dehydration. You don’t even need to go check it often as this trap is designed to be low maintenance. You just need to empty it when it becomes full. Wash it, let it dry, and it is ready to use again. Thereafter, all you just need to do is set up a fresh bait inside it to continue attracting insects. This is an economical way to deal with these invaders as you only need to get more baits and not the entire product. If you set this yellow jacket trap before spring, it will attract and kill the queen before they build a nest. Wasp Traps is one of those brands that streamline its efforts. And it is known that the more focused one is on a particular skill, the better one gets. This is the exact reason this brand has gotten this good. It has been focused, for years, on the control and management of hornets, wasps, and yellow jackets. It has offered many products that have been doing great, helping many households control their infestations. 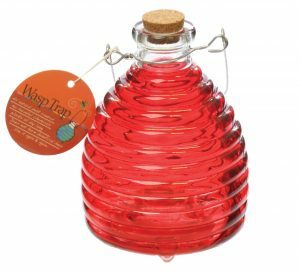 The Wasp Trap Colorful Glass Trap is one of the prettiest ways you can control insect infestation. 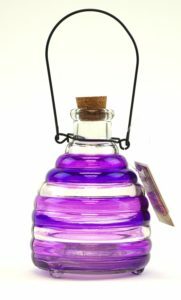 The first thing you will notice about this product is the beautiful purple glassware. You will probably mistake it for something that should be in the pantry, or maybe on a wooden console in your living room. This product is actually aesthetically decorative. It is ideal for use in outdoor kitchens, play areas, back porches, patios, etc. Using this product is pretty much straightforward. It is meant to be hung outside where wasps, yellow jackets, and hornets are a problem. This product does not come with a bait, so you will have to make one yourself. Don’t worry, you don’t need to get your lab coats for this one. Sugar water or fruit juice is enough to serve as bait. Remove the cork at the mouth of the bottle, tilt it a bit and pour your bait inside and tightly fix the cork back. This will easily attract those pesky insects and they will quickly find the entrance hole at the bottom. Don’t worry, the bait will not leak through as there is a built-in trough inside the glass container. Once they enter to feast, there is no coming back out for them and they will eventually die off. As you must have figured, this product is reusable for as long as you wish. As long as those insects are still a problem, you can continue using it over and over. This is an economically smart alternative to some other variants that require you to keep buying. Another possible advantage is that if you know how to prepare baits that will attract other types of insects, you can use this to control almost any insect infestation. When the glass is full, you just need to remove the cork again and empty its content into the trash and ready it for the next bout. Great! Well done for getting to the end of our list. We hope that by now you have been well informed and will not have much of a problem deciding on which of the products we have listed will provide the best results for your needs. Now, make a choice, and start getting rid of those pesky wasps.